leader of Israel following the victory. reacted to the decision in an article published on the newspaper’s website2. purpose, would be likely to be understood as anti-Semitic or feed into such discourse. and promised to review his editorial procedures to avoid further controversy. nevertheless dismissed in dishonourable conditions. control is likely to become a model. The CRNI regional rep was questioned once again by Israeli forces. Just Word Books, publishers of Mohammad Saba’aneh’s cartoon collection White and Black have let us know that the cartoonist was detained and questioned on Allenby Bridge while journeying to his home in Ramallah from a cartoon festival in Belgium. The full details of the events of May 31st can be read here. Of particular note is the reported confiscation of a substantial piece of artwork; Saba’aneh says a large cartoon print in the style of a narrative tapestry was taken from him. 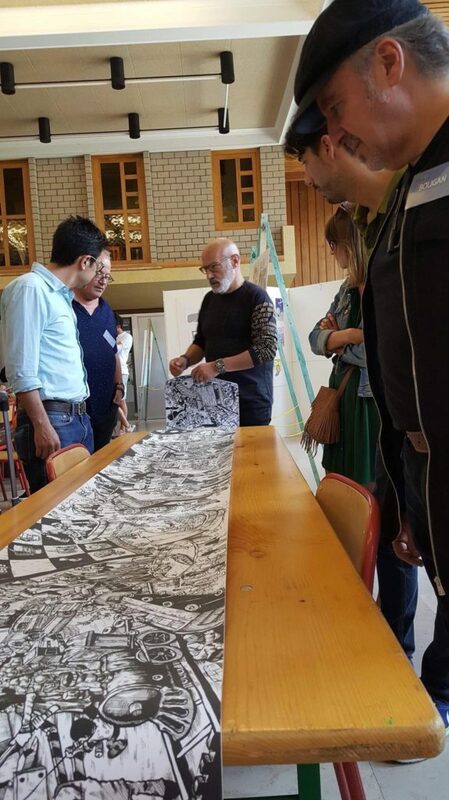 Saba’aneh and international cartoonist colleagues look at the print of his work later confiscated by Israeli border forces. In 2016 we were informed of a very similar incident when Saba’aneh re-entered the country from a work assignment in Jordan. Allenby Bridge is the sole entry point for West Bank Palestininans travelling abroad and was the site of his 2013 arrest that led to five months in prison. CRNI’s regional representative in Palestine, Saba’aneh has in the past been harassed by officialdom on both sides of the border. He is a courageous artist and campaigner dedicated to justice and peace. We trust he is unbowed by this latest affront but none the less condemn the baseless harassment and detention described and call for the immediate return of his property, its confiscation being an outrageous act of censorship and vandalism. We commend Just World Educational for their unflinching support of Saba’aneh and his work. UPDATE 06/14 – Rogers confirms his dismissal via Twitter. Sad to report this update: Today, after 25 years as the editorial cartoonist for the Pittsburgh Post-Gazette, I was fired. Rob Rogers, political cartoonist at the Pittsburgh Post-Gazette, has been dropped from the paper’s opinion pages. Roger’s June 1st cartoon is an example of work that did not appear in the paper that employs him. Our friends at the American Association of Editorial Cartoonists (AAEC) have made a statement concerning his apparent disappearance. Local news radio 90.5 WESA has more, reporting that last week five of Rogers’ cartoons were not punished and that this is due to intervention by editorial director Keith Burris, seemingly a supporter of President Donald Trump. Rogers’ work continues to appear unabated via his website and social media. He is a recipient twice over of the Overseas Press Club’s Thomas Nast Award, the National Headliner Award, numerous Golden Quills, the National Press Foundation’s Berryman Award and a finalist for the Pulitzer Prize. 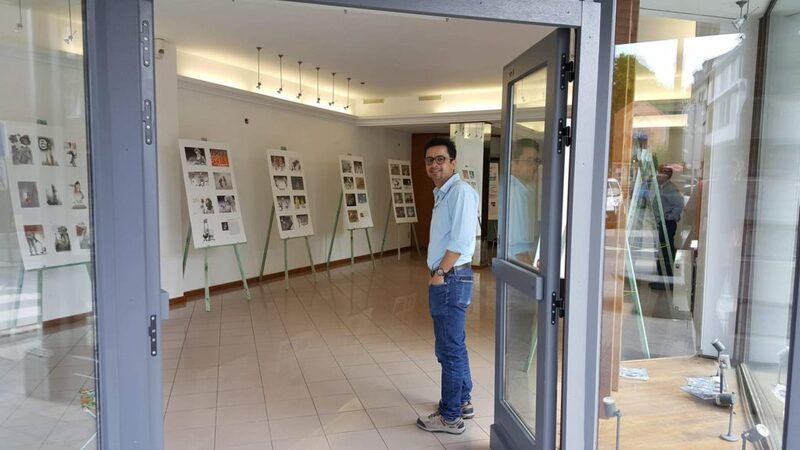 He’s also committed to freedom of expression and preservation of the cartoon art form, serving as president of the AAEC in the past and currently at the Toonseum as well as making a generous donation to CRNI, enabling us to assist a refugee cartoonist in the Middle East. It is disturbing to see a high-profile advocate for and proponent of cartooning being censored in such a blatant manner. We trust the readers of the Post-Gazette will make their feelings known in due course. UPDATE 06/06: latest reports indicate Kurtcebe has been released on probation. More to follow. 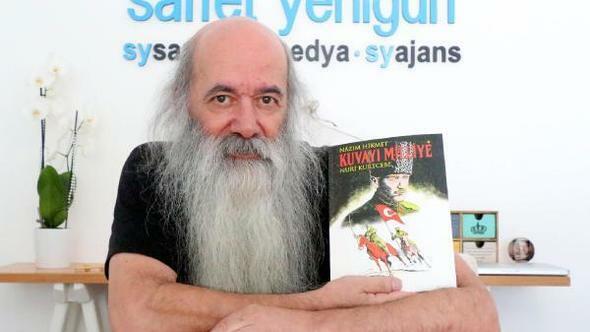 Respected political cartoonist & graphic novelist Nuri Kurtcebe has been given a 14 month prison sentence. In what is becoming a depressingly familiar pattern, Turkish media reported yesterday that another high-profile press and media worker has fallen foul of Turkey’s penal system. Nuri Kurtcebe has been found guilty of “insulting” President Erdoğan in a cartoon from 2015. Long-time readers of CRNI’s blog will recall that Erdoğan has engaged in industrial-scale persecution of academics, broadcasters, comedians, commentators and satirists for some time. Today Turkey ranks as the world’s number one jailer of journalists. Kart refers to the presidential election later this month. Kurtcebe’s cartoon suggests that Turkey’s nominally secular government may not be as the president contends. Kurtcebe is one of the co-founders of the original Gırgır magazine. Its successor was shut amid a “blasphemy” controversy last year which led to a third cartoonist, Seyfi Şahin being sent to prison two weeks ago. We echo Musa Kart’s sentiments and hope that Turkey’s cartoonists can look forward to the return of normal working conditions in the near future. Nine months on, Ramón has left Equatorial Guinea behind. The cartoonist is safe and well with friends in Madrid, Spain. Earlier this year we reported that Ramón Nsé Esono Ebalé aka Jamón y Queso, recipient of 2017’s Courage in Editorial Cartooning Award, had been cleared of all criminal charges levelled against him in Equatorial Guinea. Despite his proven innocence Ramón was not given his passport upon release from police custody. Hence he was still in effect a prisoner. He is an E.Guinean citizen but his home and family are in El Salvador. Today we are happy to report that Ramón’s documents were returned and he is free at last. A statement released today and co-singed by CRNI reads as follows. 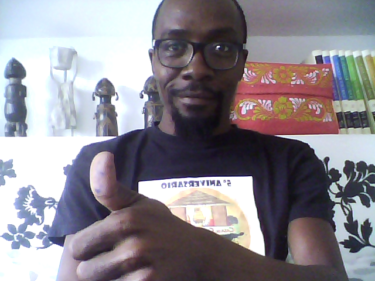 (Nairobi, May 29, 2018)—The Equatorial Guinean artist Ramón Esono Ebalé left the country on May 28, 2018, after being imprisoned for six months on apparently false charges and then waiting three months for travel documents, 13 rights organizations said today. The human rights groups and advocates are APIM, Arterial Network, Committee to Protect Journalists, CRNI, Caoilfhionn Gallagher QC, Jonathan Price, Paul Mason, International Media Defence Panel, Doughty Street Chambers, EG Justice, FIDH, within the framework of the Observatory for the Protection of Human Rights Defenders, World Organisation Against Torture (OMCT), within the framework of the Observatory for the Protection of Human Rights Defenders, FREEMUSE, Human Rights Watch, Index on Censorship, PEN International, and Reporters without Borders. We commend Tutu Alicante and EG Justice as well as all the other organisations who have worked tirelessly on Ramón’s behalf since his detention last September. Reports emerge from Turkey that a cartoonist has been given a prison sentence for “insulting sacred values”. Seyfi Şahin has been jailed for one year and fifteen days after portraying the Biblical figure of Moses in a cartoon, says the Stockholm Center for Freedom, Turkey Purge and Turkish Minute blogs. 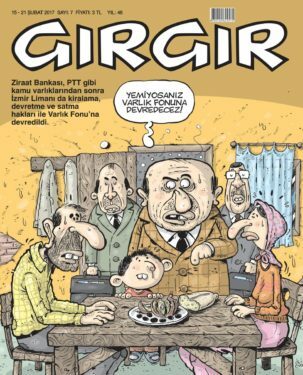 The cartoon in question led to the sudden and complete closure of the Gırgır humour magazine in 2017. Our original news item published on the 17th of February last year is below. Şahin is far from the only media worker to suffer persecution Turkey, the biggest jailer of journalists on Earth, and not even the sole cartoonist. Our past Courage in Editorial Cartooning Award winners Musa Kart and Dogan Güzel have both endured further woes in recent years and all Turkish cartoonists in contact with CRNI attest to a more difficult environment as outlets for their work are variously censored and curtailed. The Dokuz8 news feed reports that Turkish magazine Gırgır has been closed due to the publication of a cartoon featuring the figure of Moses. However CRNI understand that the modern incarnation of Gırgır is different from the original magazine which at one time was the most popular in the country. The charge of religious hatred is reflected in reports on ABC News and elsewhere. The contention that “ulterior sinister motives” were at play echoes the accusations levelled at cartoonists, journalists, media workers, public servants and academics who have been variously dismissed and jailed across Turkey under the regime of Recep Erdoğan. The President was a regular subject of fun for the magazine. A statement from their now-defunct Twitter account apparently expressed sincere regret over any offence caused, citing “lack of sleep and exhaustion” for its appearance in print. The front cover of the latest and evidently last issue of the magazine.